The FadR subfamily of regulators plays essential roles in the regulation of diverse metabolic pathways in bacteria. LldR, an FadR-type regulator, regulates lactate utilization in Pseudomonas aeruginosa. Sequence network analysis of the LldR proteins from different bacterial species showed that LldR proteins from Pseudomonas sp. and Escherichia coli were separated into different clusters, suggesting that LldRs are derived from two ancestors that functionally diverged. Then, the recombinant PLldR protein (LldR of P. aeruginosa) was expressed, purified, and crystallized. Preliminary X-ray diffraction analysis of LldR protein crystals was performed. The PLldR crystal diffracted to 2.55 Å resolution and belonged to the trigonal space group P3, with unit-cell parameters a = 68.5 Å, b = 68.5 Å, and c = 237.0 Å. These results will facilitate further understanding of the regulatory mechanism and the adaptation to sensing of both l -lactate and d -lactate of LldR proteins from Pseudomonas sp. in lactate metabolism. The GntR family of bacterial regulators that possess the helix-turn-helix motif was first described by Haydon and Guest (1991), and comprises approximately 270 members. The first GntR subfamily, which regroups 40 % of GntR-like regulators, is called FadR. Most proteins of the FadR subfamily possess an all-helical C-terminal domain with six or seven α-helices (Rigali et al. 2002). Being an FadR-type transcription factor, LldR is essential in the regulation of lactate aerobic metabolism. In Escherichia coli and Corynebacterium glutamicum, LldR represses the expression of an l -lactate utilization operon in the absence of l -lactate. l -Lactate but not d -lactate interfered with the binding of LldR to the promoter of l -lactate utilization operon (Futai and Kimura 1977; Gao et al. 2008, 2012). An NAD-independent l -lactate dehydrogenase (l -iLDH) is encoded in this operon and specifically catalyzes the oxidation of l -lactate to pyruvate which finally enters the Krebs cycle. The NAD-independent d -lactate dehydrogenase (d -iLDH) in these two bacterial species is constitutively transcribed and not regulated by LldR (Gao et al. 2012; Futai 1973). In Pseudomonas sp. strains, however, the regulation of lactate utilization is quite different. Both l -iLDH and d -iLDH are located in the same operon, the expression of which is regulated by LldR in response to either l -lactate or d -lactate (Gao et al. 2012). Sequence analysis indicates that LldR from Pseudomonas aeruginosa shares 42 % and 29 % sequence identity with that from E. coli and C. glutamicum, respectively. Although the crystal structure of LldR from C. glutamicum was reported (PDB code: 2DI3) (Gao et al. 2008), how LldRs from different species sense and discriminate the two enantiomers of lactate (l -lactate and d -lactate) is still unknown. In this study, we performed the sequence network analysis of the LldR proteins from different bacterial species and found that LldR proteins from Pseudomonas sp. and E. coli are separated into different clusters, suggesting that LldRs are derived from two ancestors that functionally diverged. We then cloned the full-length lldR gene from the P. aeruginosa strain XMG, and subsequently expressed and purified the recombinant LldR protein (named PLldR). Crystals of PLldR of diffraction quality were obtained, and an X-ray diffraction dataset was collected and processed to 2.55 Å resolution. These results provide the first step towards the determination of the crystal structure of PLldR and towards the understanding of its regulatory mechanism and adaptation to sensing of both l -lactate and d -lactate. A blast search was performed using the LldR sequence from the P. aeruginosa XMG strain, and the sequences of LldR homologues with sequence identity more than 30 % were retrieved from the Refseq database (Pruitt et al. 2007). Protein similarity network analysis was performed by BlastP searches comparing each sequence against another. The result was imported into the Cytoscape software package (Cline et al. 2007) using the Blast2 similarity plugin (Wittkop et al. 2010). The nodes were arranged using the yFiles organic layout provided with Cytoscape version 2.8.3 (Fig. 1). The sequences of amino acids of three LldR homologues, including LldR from P. aeruginosa XMG, E. coli (named ELldR), and C. glutamicum (named CLldR), were aligned with the program CLUSTAL_X (Fig. 2) (Thompson et al. 1997). Secondary structures of PLldR and ELldR proteins were predicted using the secondary structure prediction program PSIPRED (McGuffin et al. 2000). Besides, three-dimensional structure prediction of the PLldR and ELldR proteins was performed using the I-TASSER server (Fig. 3) (Zhang 2008). Superimposition of the crystal structure of CLldR with the predicted three-dimensional structures of PLldR and ELldR was performed by Pymol (Fig. 4) (Bramucci et al. 2012). All the structure figures were made by Pymol. The genome of P. aeruginosa XMG has been sequenced recently (Gao et al. 2012). The open reading frame (ORF) encoding PLldR was amplified by PCR with the forward primer 5′ CATATGATGGAATTTGGTCAGGTCAG 3′ and the reverse primer 5′ GAATTCTTAGTCTTCCTGCACGCTG 3′. Then, lldR was cloned into the NdeI and EcoRI restriction enzyme sites of the multiple cloning site (MCS) of the expression vector pET-28a(+) (Novagen). The recombinant plasmid was sequenced and transformed into E. coli BL21 (DE3) (Table 1). The recombinant E. coli cells were cultured in Luria Broth (LB) medium with 50 μg mL−1 kanamycin at 310 K until OD600nm reached 0.6–0.8. Then, the bacterial culture was induced with 1 mM isopropyl-d-1-thiogalactopyranoside (IPTG) and grown for another 16–18 h at 289 K. Cells were then harvested by centrifugation at 6000×g for 30 min. The cell pellet was resuspended with buffer A that consists of 25 mM Tris–HCl, pH 8.0, 300 mM NaCl, and 20 mM imidazole, supplemented with 1 mg mL−1 aprotinin, 1 mg mL−1 leupeptin, 30 mg mL−1 lysozyme, and 0.05 mM phenylmethylsulfonyl fluoride (PMSF). The cells were then lysed by sonication and centrifuged at 10,000×g for 40 min. The clarified supernatant was loaded onto a nickel affinity column (GE Healthcare) pre-equilibrated with buffer A. The column was then washed with 50 mL buffer A, and the His-tagged PLldR was eluted using an imidazole gradient (50–250 mM). The purity of the eluted protein was checked by SDS-PAGE with Coomassie Blue staining (Fig. 5a), and the purified protein was concentrated to 1–2 mL by Amicon Ultra Centrifugal Filters (Millipore, Germany) at 3000×g. For further purification, the protein solution was passed through a Superdex 200 gel-filtration column (GE Healthcare). The column was pre-equilibrated with 25 mM Tris–HCl, pH 8.0, 300 mM NaCl, and 2 mM dithiothreitol (DTT). The purified protein was then concentrated to 10 mg mL−1, frozen in liquid nitrogen, and stored at 193 K for further study. The initial crystallization screening trials of the purified PLldR were performed manually by the method of hanging-drop vapour diffusion in 24-well plates at two different temperatures (287 and 297 K). Typically, 1 μL protein solution was mixed with 1 μL reservoir solution and equilibrated against 160 μL reservoir solution (Table 2). Over 700 different conditions were screened. The commercially available crystallization screen kits used included Index (conditions 1–96), crystal screen and crystal screen 2 (conditions 1–98), crystal screen lite (conditions 1–50), PEGRx 1 and PEGRx 2 (conditions 1–96), SaltRx1 and SaltRx2 (conditions 1–96), PEG/ion screen and PEG/ion 2 screen (conditions 1–96) kits from Hampton Research, and wizard screen I, II, III, and IV (conditions 1–192) from Emerald BioSystems. Five conditions yielded native PLldR crystals after 2 weeks, but single crystal could only be obtained under one condition [0.1 M Tris–HCl, pH 8.5, 4 % (w/v) PEG 8000, which is the condition No. 36 of crystal screen lite]. The crystallization condition was subsequently optimized by changing the concentrations of precipitant, salts, and buffer around the initial hit condition. After further optimization, crystals of the best quality were obtained after 1 week, with the maximum dimensions reaching 0.35 × 0.05 × 0.05 mm. The optimized crystallization condition was 2 % (w/v) PEG 8000, 0.1 M Tris–HCl, and pH 8.5, using the hanging-drop vapour-diffusion method in 24-well plates at 287 K.
Crystals of PLldR from the 24-well plates were harvested using cryoloops and transferred to a cryoprotectant solution, which consisted of 2 % (w/v) PEG 8000, 0.1 M Tris–HCl, pH 8.5, and 25 % (v/v) glycerol. The crystals were then flash-cooled by immersion into liquid nitrogen. Crystal diffraction datasets were collected, with one dataset for each crystal, at the beamline BL17U1 at the Shanghai Synchrotron Radiation Facility (Shanghai, People’s Republic of China). 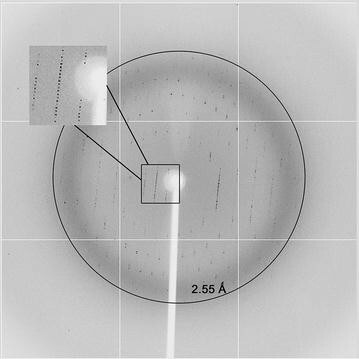 In particular, a complete diffraction dataset for a single crystal, which is reported in this study, was collected by an ADSC Quantum 315r CCD area detector, and processed to 2.55 Å resolution using the HKL-2000 software (Otwinowski and Minor 1997). The data-collection statistics are listed in Table 3. Sequence similarity network is a powerful method dealing with the functional classification of a large number of protein sequences (Atkinson et al. 2009). Each protein sequence is represented by a node, and an edge is only drawn between a pair of nodes that have a BlastP e-value more stringent than a certain cut-off value. To construct a sequence similarity network of LldR homologues, a blast search of PLldR from the P. aeruginosa XMG strain was carried out and a total of 425 sequences that share >30 % sequence identities were retrieved. The retrieved sequences also include the PdhR from E. coli protein which senses pyruvate and regulate the expression of pyruvate dehydrogenase (PDH) multienzyme complex (Ogasawara et al. 2007). The e-value threshold was set to 10−70 to just separate the two functional diverged proteins LldR and PdhR from E. coli into different clusters (Fig. 1a). It is interesting to note that at this e-value threshold PLldR from P. aeruginosa XMG is also in a different cluster; the most sequences is from Pseudomonas, implying the functional divergence of Pseudomonas LldRs and ELldR. This is consistent with the fact that LldR from Pseudomonas senses both l -lactate and d -lactate, while the ELldR only senses l -lactate. At a more relaxed e-value threshold of 10−60, LldRs from E. coli and P. aeruginosa remain in different clusters, while the cluster containing PdhR merges with that containing LldR from P. aeruginosa (Fig. 1b), suggesting that LldR from Pseudomonas is evolutionarily more closely related to PdhR than LldR from E. coli. A multi-sequence alignment was performed using PLldR and its homologues, including ELldR and CLldR. As shown in Fig. 2, a certain sequence identity exists between PLldR and ELldR (42 % sequence identity) and between PLldR and CLldR (29 % sequence identity). According to the determined crystal structure of CLldR from C. glutamicum in complex with its target operator DNA, there are four conserved amino acid residues indispensable for DNA-binding, which are also conserved in FadR. The corresponding residues in PLldR from P. aeruginosa, R38, R48, R52, and G69 were identified. Besides, the four putative PLldR residues involved in Zn2+-binding (D152, H156, H205, and H227) were indicated, which are also completely conserved among PLldR from P. aeruginosa and its homologues. This suggests that a common structural feature of Zn2+-binding exists in the regulatory domain of LldRs (Gao et al. 2008). To further analyze the LldR homologues, the secondary structures of PLldR from P. aeruginosa and ELldR from E. coli were predicted using the secondary structure prediction program PSIPRED (Fig. 3a, b). The amino acids residues of PLldR and ELldR with predicted α-helices or β-sheets were then marked on the protein sequence alignment with magenta or yellow colors, according to the prediction results. The amino acids residues of CLldR from C. glutamicum, whose crystal structure was solved, were also similarly labeled according to their secondary structures. The comparison result showed in Fig. 3c indicated that LldRs from P. aeruginosa and E. coli shared similar secondary structure with LldR from C. glutamicum, and both consist of ten α-helices and two β-sheets. Like CLldR, the N-terminal domain of PLldR, which comprises of α1, α2, α3, β1, and β2, contains a typical prokaryotic helix-turn-helix (HTH) DNA-binding motif. This is consistent with the common feature of HTH family of transcription factors. As shown in Fig. 2, this HTH motif possesses the most conserved amino acids residues. The residues of the HTH motif of PLldR from P. aeruginosa showed 50 % sequence identity with those from C. glutamicum and 64 % sequence identity with those from E. coli, indicating that the HTH motif is more conserved than other parts in these three LldR proteins. The predicted secondary structure of the C-terminal region of PLldR consisted of seven α-helices (α4–α10), which is also the same as the case of CLldR. This region is supposed to be a regulatory domain, which plays an important role in ligand-binding and dimerization (Gao et al. 2008). The crystal structure of CLldR was reported by Gao et al. (Fig. 4a) (Gao et al. 2008). However, the structures of PLldR and ELldR are still unavailable. The three-dimensional structure prediction of the PLldR and ELldR proteins was then performed using the I-TASSER server; the results were showed in Fig. 4b, c. The three-dimensional structures of these three LldR proteins were superimposed and compared. As shown in Fig. 4d, the overall structures of the three LldR proteins were quite similar. The root-mean-square deviation (RMSD) between CLldR and PLldR was 0.467 Å for 131 aligned Cα atoms; the RMSD between ELldR and CLldR was 0.433 Å for 136 aligned Cα atoms; and the RMSD between ELldR and PLldR was 0.448 Å for 176 aligned Cα atoms. The N-terminal domains of these three LldRs matched each other quite well, which are responsible for DNA-binding. This result is consistent with its high sequence conservation across evolution. On the other hand, there are some differences existing in several loops among the C-terminal domains of PLldR, ELldR, and CLldR, which might be due to the difference in the ligands they recognize. For instance, PLldR can associate with both l -lactate and d -lactate, while ELldR can only recognizes l -lactate. To perform a crystallographic analysis of PLldR, the recombinant plasmid pET-28a-lldR was constructed and successfully transformed into the E. coli strain BL21 (DE3). The full-length PLldR protein from P. aeruginosa was expressed as an N-terminally His-tagged protein (theoretical molecular weight of ~28 kDa) and purified by Ni2+-affinity and gel-filtration chromatography. The results of gel-filtration chromatography showed that PLldR was eluted as an approximately 60-kDa protein, indicating that PLldR exists as a dimer in solution. Crystallization screening and further optimization yielded rod-shaped PLldR crystals. An PLldR crystal obtained in the optimized crystallization condition [2 %(w/v) PEG 8000, 0.1 M Tris–HCl, pH 8.5] is shown in Fig. 5b. The crystal diffracted to 2.55 Å resolution (Fig. 6) and belonged to the trigonal space group P3, with unit-cell parameters a = 68.5 Å, b = 68.5 Å, and c = 237.0 Å. Diffraction data were collected and processed with a final R merge value of 9.2 % (87.2 % for the highest resolution shell). The data completeness, data multiplicity, and average I/σ(I) values of the collected dataset were 99.7 %, 5.7, and 18.1, respectively (99.6 %, 5.7, and 2.2 for the highest resolution shell, respectively). Based on the calculation of the Matthews coefficient, it is estimated that there are four molecules of PLldR in each asymmetric unit. In this case, the Matthews coefficient is 2.77 Å3 Da−1, which corresponds to a solvent content of 55.6 % (Matthews 1968). Further work towards structural determination is underway. Selenomethionine-substituted PLldR protein is also being prepared. For a better understanding of lactate-binding modes and regulatory mechanism, co-crystallization or soaking the PLldR crystals with the substrates (l -lactate and d -lactate) are also in progress. This study would shed light on revealing the mechanisms of the FadR family of regulators that regulate many important microbial metabolic processes. GW and CM designed experiments. BX and KZ performed experiments. CM, GW, and PX contributed reagents and materials. BX, HT, GW, and YH analyzed data. BX, YH, and GW wrote the manuscript. All authors read and approved the final manuscript. This work was supported by Grants from the National Natural Science Foundation of China (31270090). The authors thank the staff of beamline BL17U1 at the Shanghai Synchrotron Radiation Facility for assistance during the data-collection process.